Trust your government or they’ll give you a reason not to trust them! We have no idea what a (nominally privatized) national ID database has to do with FEMA’s ostensible role in managing responses to emergencies. Does FEMA plan to deny Federal assistance in disaster recovery to people who don’t have (and may never have had) ID? 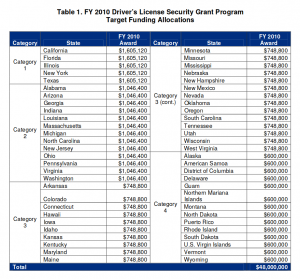 But whatever the rationalization for its involvement, FEMA has provided tens of millions of dollars a year in grants to states for “drivers license security”. FEMA has described these grants as being for “combined efforts of multiple States to work collaboratively in the design and development of a personal identification verification system architecture that all States share”. Much of this money has probably gone to AAMVA and its subctontractors for work on SPEXS and S2S. 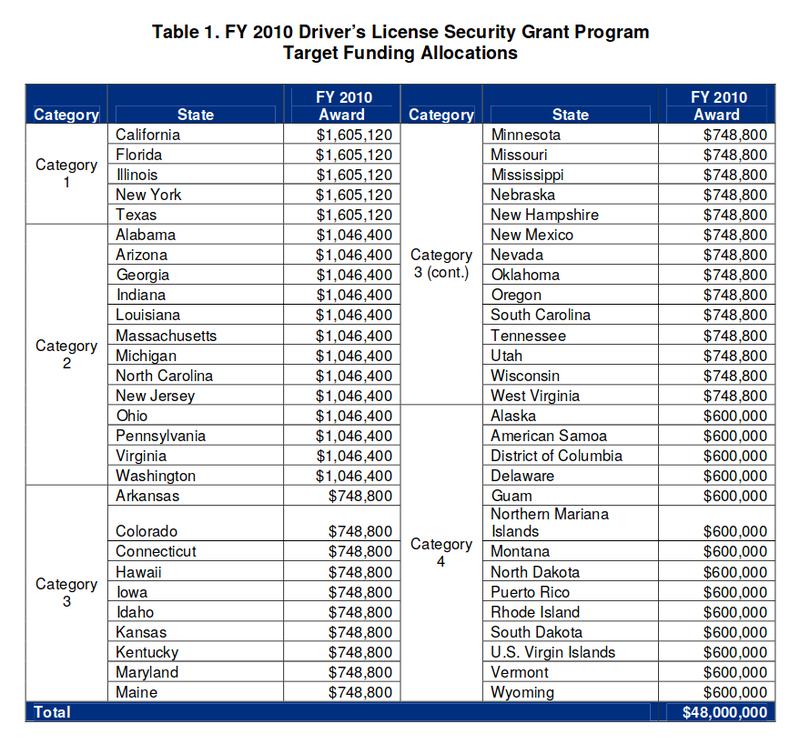 In Fiscal Year 2010, for example, FEMA handed out $48 million in these grants, including money for every state. 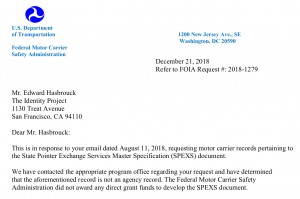 To find out more, we asked both FMCSA and FEMA for their records of the SPEXS Master Specification, and asked DHS for its records of any grants for SPEXS. 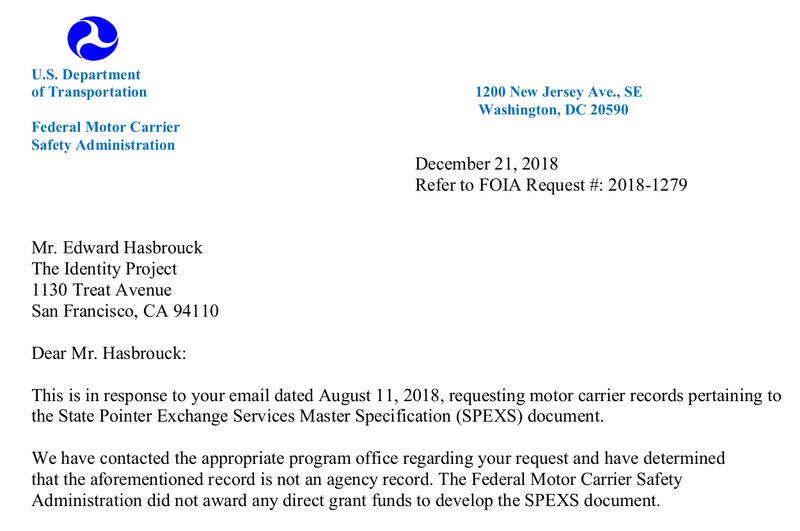 The carefully worded response from FMCSA says that agency “did not award any direct grant funds to develop the SPEXS document”. That’s probably true, but weaselly. The FCMSA (and FEMA) funding was almost certainly laundered through state agencies before reaching AAMVA and AAMVA’s subcontractors. It’s not clear why the FEMA (DHS) or FMCSA (DOT) would fund the development of specifications for a national database, but not obtain a copy of the document. Were they carrying out no oversight of how grant money was spent? Or were they trying to maintain “plausible deniability” about whether SPEXS is a Federal (or Federally funded) database? FEMA’s response does, however, refer to, “the group receiving the grant”, which suggests that FEMA was able to identity the relevant grant. We’re still waiting for any response to our separate request for records of this and any other DHS grants for SPEXS, which has been referred to FEMA as well as to DHS headquarters. History records that the money changers have used every form of abuse, intrigue, deceit, and violent means possible to maintain their control over governments by controlling money and its issuance.